It's been two weeks since Technology in Practice 2014 came to a close, and we know from the feedback we've received directly and through the hundreds of session surveys you completed that many of you uncovered some ideas and concepts that really were "Music to Your Ears". Hearing that feedback makes the hard work and energy that goes into planning a conference well worth it. We are happy to announce that the 2014 Conference Materials are now available for download. Click on the link below and fill out the form to gain access to the download page. You are welcome to share the materials with your colleagues, but we remind you that all materials are copyright protected and are only to be used for reference purposes. Conference Materials are now available by request only. Please email conference@commonwealthlegal.com for access. 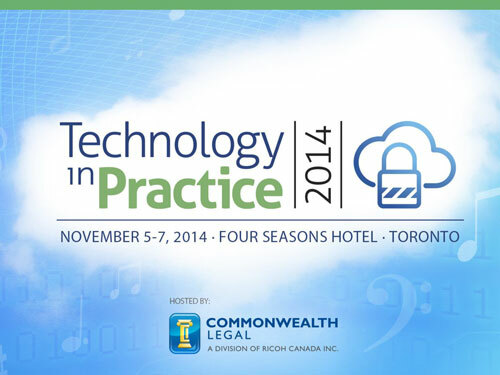 Thanks again for joining us at Technology in Practice 2014!